Born in Düsseldorf, Germany in 1965, Mariele Neudecker is Bristol-based and has lived and worked in Ireland and the UK since 1985. Internationally renowned for her atmospheric reproductions of landscapes within glass vitrines, Neudecker uses sculpture, film and photography to create a dynamic between historical cultural representations of the sublime landscape and our perception, imagination and memory of the reality of experience. More recently, she has created an evocative film installation in response to Gustav Mahler’s Kindertotenlieder (Songs on the Death of Children). 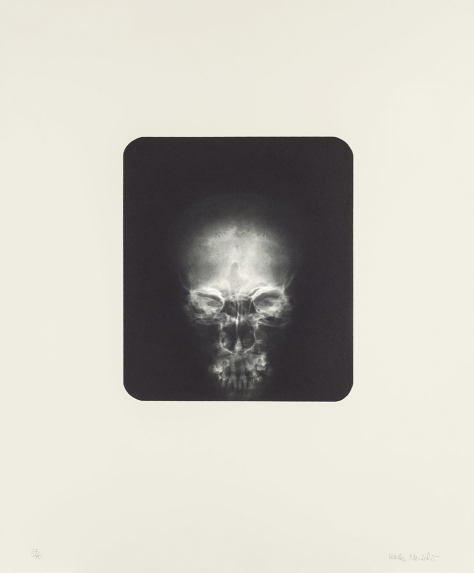 Her etching ‘Truth is an Overrated Virtue’ is an x-ray of a female skull taken in 1952. Mariele Neudecker is represented by Barbara Thumm Gallery, Berlin.